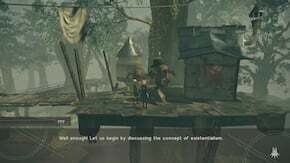 Jean-Paul's Melancholy \ Sartre's Melancholy is a Side Quest in NieR: Automata. "The machine lifeform known as Sartre (Jean-Paul) lives in Pascal's Village and speaks in byzantine philosophical passages. Talking to him proved a frustrating - and fruitless - endeavor, so speak to his female admirers to learn more about him"
"A woman in Pascal's village explained that Sartre (Jean-Paul) has additional followers in the amusement park and desert. Find these two fans, and give their presents to Sartre"
"Sartre (Jean-Paul) seemed rather... nonplussed about the gifts. Go tell the three fans how he responded/"
"Despite being rejected by Sartre (Jean-Paul), his followers made no attempt to see him for what he truly was. As Sartre (Jean-Paul) also had no interest in understanding his followers, he began to question the overall meaning of the relationship." "After visiting Sartre (Jean-Paul) again, you learned that he left a letter behind before departing on a journey. He devoted himself to philosophy to the very end, never once taking notice of those who held affection for him." Deliver all gifts to Sartre (Jean-Paul). Tell Sartre's (Jean-Paul's) fans what he thought of the gifts. Return to Machine Village to talk to Sartre (Jean-Paul). This quest unlocks upon your return to the Machine Village after the Assault event. To find the NPC for the quest, go in and past the Weapons/Item shop, up a ladder and right until you see a platform exiting to the right. Follow it to find Sartre, a hat-wearing machine. Next you return to the middle portion, go left and down a ladder, then take a right from the ladder and access point. Talk to the Machine with Makeup and you will receive Letter for Sartre (Jean-Paul), you must take it to Sartre (Jean-Paul). He won't even bother responding to the letter, but talking to the machine with makeup again reveals she does not care. Find the other fans, one in the Amusement Park, it's the Machine with a Dream, located on your left as you come up the main stairs. She gives you a Beautiful Glass to gift to Sartre. He will call it a trifle and say no reply is needed. The other one in the Desert Housing area, Machine in Love gives you a Machine Fossil to gift to Sartre (Jean-Paul). He will say he will not waste words on mere junk. Tell all of the followers of the rejection, then return to Sartre (Jean-Paul) once more. He will not be there, and the Ball-like Machine will tell you he left on a journey. You will obtain Sartre's Letter (Jean-Paul's) x1. In English releases of the game, Sartre is referred to by the name Jean-Paul, and as such the quest is titled "Jean-Paul's Melancholy"
It&apos;s just brilliant. Jean-Paul Sartre was a French Existentialist Philosopher/Author. He was awarded the Noble Literature Prize in 1964 but declined it. His most famous work is arguably "Nausea", but references for this game, his works "Being and Nothingness", "The Transcendence of the Ego" as well as "Existentialism is a Humanism" are obvious inspirational works that saturate the entire NieR:Automata experiance. End of Swedish Pod SE&apos;s report. The Sartre and de Beauvoir estates are sue-happy. Sartre is more consistent than Jean-Paul considering how Pascal is named. If he&apos;s named "Jean-Paul", then why is Pascal still named "Pascal" instead of Blaise (because Blaise Pascal, and Pascal is the last name, not the first name y&apos;know)?